From the kitchen of One Perfect Bite...I periodically have a taste for something outside my culinary comfort zone. It doesn't have to be gourmet or high-end, just different. Today was one of those days. Cabin fever, triggered by a rain of deluge proportions, sent me to my cookbooks. I was looking for a recipe, that while unusual, wouldn't involve a trip to the store and could be made from ingredients I had in my pantry or freezer. I had turnips that I wanted to use before they became fodder for the compost heap and I found a, new to me, recipe in Savoring America, a Williams-Sonoma cookbook. For whatever reason, I don't often cook turnips. I remember disliking them as a child and the only time I've used them as an adult was in a lovely, but fat-packed, turnip bisque. This offering is much healthier. I'm really happy to report that these unusual griddle cakes are fast, easy and really delicious. The crisp exterior masks a surprisingly creamy interior that is wonderfully flavorful. I certainly would make these again. Here's the recipe. 1) Place turnips in a medium bowl. Toss with 2 tablespoons butter. 2) In another large bowl, beat half-and-half with egg and salt. Stir in flour and mix just to combine. Add turnips and fold until evenly coated. 3) Heat a large, heavy frying pan or griddle. Coat bottom with enough of reserved butter to prevent sticking. 4) For each griddle cake, spread a heaping spoonful of batter on grill to form a 3-inch cake. Fry, turning once, until both sides are a deep brown, about 5 minutes per side. Transfer to a platter and keep warm in a low oven until all batter has been used. Serve immediately with sour cream and chervil if desired. Yield: 20 to 24 3-inch cakes. Out of my comfort zone too Mary, but I would like to try them. I can imagine them being a lovely accompaniment to a soup for a light meal. I have a bag of turnips - which I love, by the way - and was searching for some unusual way to prepare it. I am making these and will report back, definitely! Wow Mary - this is unique! I'm funny about pancakes. Can't even eat the potato ones, so I'm not sure this would fly for me - but you get points for trying! I do like turnip roasted with other root veggies and suitably seasoned in the Winter months. About the only time I eat it though. my word! what a great way to have turnips... Thanks for the recipe! Never imagined turnips can be used like this. Thanks for sharing such a great recipe. I would have never thought this either! You always introduce us to unusual recipes Mary. yum! Your description alone makes me want to make them. How fun--I love turnips and the griddle cakes look amazing. At my favorite dim sum place here they have a turnip cake that is really delicious--these remind me of them. Hmmm, my mother-in-law loves turnips and I'm thinking these would make a lovely lunch or side to a soup or salad. Thank you- they'll be visiting soon! I'm with you, Mary, I never do turnips. They area poor orphan vegetable in my kitchen... when I do buy them they sit in the back of the vegetable bin until they go off... this could be a reason to start afresh! this is something new for me, anyway, it looks good! This is something new and unique to me. Love its golden cripsy look. 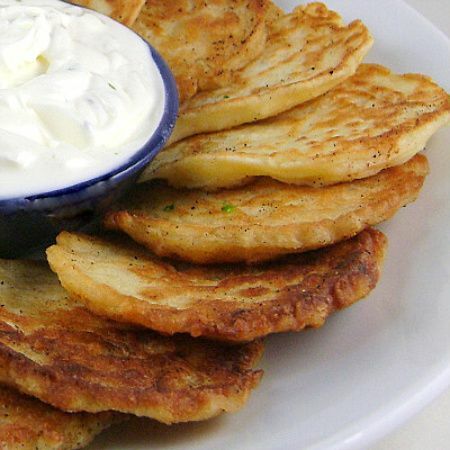 This reminds me of potato latkes, but using turnips instead must be even better! I'm a big turnip fan--in couscous, it's delicious! Have a great day, Mary! ciao!! un'ottima ricetta! particolare e originale!!! complimenti!!!! un abbraccio ciao ciao! That is an interesting way to use turnips. The sour cream and the entire combo sounds interesting. Thanks for sharing this! I always get a ton of turnips from my CSA and I never know what to do with them. Bookmarking this! For some reason turnip only shows up on holidays at the dinner table, but with every other food item it would show up more often if made in such a way that I would love it. This is one of those dishes.. I use turnips in soups and stews but never have tried pancakes. Why not! I don't use turnip much in my cooking. I should also get out of my comfort zone. These turnip cakes look marvelous! You absolutely got my attention. And now, I am thinking .... where are my turnips? fabulous! Your blog always temptes my taste buds. It looks so delicious. This is a 'different' but delicious use for turnips! Your description has my mouth watering for them! I admit to loving turnips but have never thought of making them into griddle cakes. These look wonderful Mary! Thanks for sharing! I've never had turnips, but these look great! This is something I will make! I actually really love the taste of turnip. Great post, Mary! I'm so glad you experimented, Mary! I love the look of these! :-) Mmm, I can just imagine the creamy interior! oo this looks so good. Reminds me of the Chinese Turnip Cake (luobo gao), which is one of my favorite things to get at dim sum. These cakes truly look fabulous. I make similar one with potatoes. Never thought to make them with turnips. The woman at our Farmers Market last fall told me they taste like dirt. I didn't buy them. Now I think I may have to reconsider. I will give these a try Mary. What a delicious, nutritious and economical treat! I think this is a perfect recipe for my foods classes to tackle. Very unusual dish and I love it! I only know to boil turnips and eat them in butter and that's about it! oh and pickle them too. Turnip fritters sounds good. These sound amazing! I love the idea of turning turnips into griddle cakes. We've been having some of those rain days as well, and there is nothing better than being able to stay at home and use what's already in the pantry to make something interesting and warming. Really unique dish. And when everything come with source it just looks so yummy and can't stop thinking about them. If you've just found One Perfect Bite and you like what you see, why not become a follower to assure you won't miss a recipe.